A film produced for Toei's 20th anniversary. A boy who is the descendant of the leader of the theives who met a grisly fate in the 1001 Nights bands together with 38 cats and a mouse to get back his rightful treasure from Ali Baba XXXIII, the descendent of Ali Baba who now rules the kingdom with an iron fist. This is a reversal of the good guy/bad guy roles in the original story! (perhaps not surprising for being a film in which Hayao Miyazaki was involved) This film is one of the most rollicking and action-packed films made by Toei, and is in an outrageously cartoonish style breaking with the Toei mold. 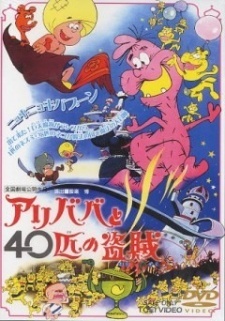 It has a spectacular lineup of animators including Yasuji Mori, Akira Daikubara, Hayao Miyazaki, Yoichi Kotabe and Reiko Okuyama. The original story about Ali Baba and the 40 Thieves itself is recounted at one point in the film in an unexpected and interesting way using shadow-puppets.